Ice can be beautiful when it’s sparkling in the sun. If you live in a cold region, however, you probably aren’t a stranger to the predicaments ice can cause: slick roads, fallen power lines, and even ice dams. Ice dams can wreak havoc on your home if you aren’t careful, creating leaks in the roof and threatening the home’s structure and contents. Luckily, there are precautions you can take to ensure ice dam prevention. Ice dams are large sections of ice that form along the edges of a roof. Much like regular dams, ice dams are barriers that obstruct the flow of water. However, ice dams are not useful like traditional dams. When the sun melts away ice and snow from other sections of your roof, the ice dam prevents the water from draining off the roof. The backed-up water may collect into a pool, seep into the shingles, and eventually drip through your roof. You may notice rust, sagging drywall, or water stains on your walls. These issues can cost a significant amount of money and time to repair, so it is best to prevent ice dams from forming in the first place. Ice dams usually form when some parts of your roof have warmed above 32 degrees Fahrenheit, while other sections are still below freezing. So although the icicles lining your roof may be picturesque, they could also be a sign that water is melting and an ice dam is forming on your roof (source). A warm attic is often the culprit of an ice dam, and one way to eliminate the issue is to keep your attic cold, which will keep your roof cold. To keep your attic cold, start by closing up any attic bypasses. Bypasses are air passageways that allow rising warm air to escape into the attic. These bypasses are commonly located around chimneys, ceiling light fixtures, heating ducts, and electrical wires. To stop the warm air from flowing into your attic, fill the gaps in your attic with foam and caulk. If you suspect that you need new insulation, hire a professional to help. Another way to regulate the temperature of your roof is through ventilation. Roofing ventilation systems use intake vents and exhaust vents to regulate attic temperature. The intake vents are located along the edge of the roof, and they allow cool, dry intake air to flush out warm, humid air through the exhaust vents that are located near the top of the roof. Installing roofing ventilation is also beneficial for the summer months because it prevents the moist, warm air from damaging the roof sheathing and shingles. As an added bonus, regulating the temperature of your attic can lower your utility bill. Ice dams cause melted snow and ice to damage your roof, but you can prevent them from forming by regulating the temperature of your roof. 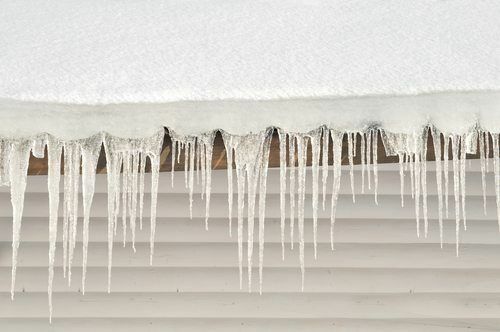 If you live near Springfield, Missouri, take action to prevent ice dams by requesting a roofing ventilation consultation from GlennStone Roofing and Gutters. You can also send an e-mail to info@GlennStone.net, call 417-860-8125, or contact us online. Proper attic ventilation is crucial to maintaining the integrity of your roof, and we will help you choose the best ventilation system for your roof’s needs. It would be our pleasure to help you with ice dam prevention.